Dr. Pendergast is an adjunct instructor at the John M. Long School of Music at Troy University in Troy, Alabama. He teaches applied euphonium lessons. Dr. Pendergast holds music performance degrees from the University of North Texas, Florida State University, a post-graduate diploma from the Royal Northern College of Music, Manchester, England where he studied with euphoniumist Steven Mead. At the University of North Texas, Dr. Pendergast studied with Donald C. Little, Marc Dickman, Peggy Heinkel-Wolfe, Jan Kagarice and briefly with Brian Bowman. Dr. Pendergast took lessons with Paul Ebbers at the Florida State University (FSU), and was the second euphonium player to earn a Doctor of Music degree from FSU after Dr. Earle Louder. 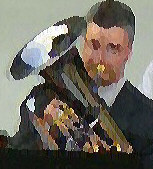 As an international performer, Dr. Pendergast has played in Monterrey, Mexico, England and Jönköping, Sweden. He taught low brass at the Bethune-Cookman College department of music from 2004 to 2006. After his family moved to Tennessee, he became an adjunct instructor of low brass at Southern Adventist University in Collegedale, Tennessee. This position he held from 2009 to 2015. While living in the Chattanooga area, Dr. Pendergast was a member of the Jericho Brass Band and a featured soloist on a number of concerts. Dr. Pendergast has co-authored A Practical Guide to Wind Band Excerpts for the Euphonium with Ryan McGeorge, published by Potenza Music. He has also arranged two works of Pavel Chesnokov: Let My Prayer Arise, Op. 24, No. 6 arranged for euphonium (or bass trombone/tuba) and trombone quartet (Potenza Music) and Do Not Cast Me Off, Op. 40, No. 5 for four euphoniums and solo tuba, published by Cimarron Music Press.